English people but rarely pride themselves upon their windows and bestow care on their adornment in the way in which do people on the Continent. In London, perhaps, the atmospheric considerations may account for this, as it is very disheartening to have pretty hangings soiled by a fog alter they have been up only a few days. Yet the treatment of the windows is only second in importance to that of the chimneypiece in the decoration of a room. 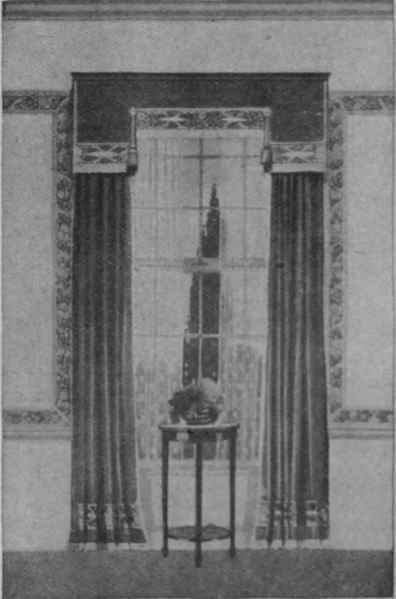 A former article (see Part 8, page 941) was devoted to the treatment of casement windows, which are put into so many of the newer houses, and which present a problem easy of solution; but the long windows reaching to the floor found in many London houses and the bay windows of the suburbs are far more difficult to deal with. It is difficult in either case to obtain that picturesque effect which is the ideal of every woman who is interested in her home. These long windows, however, have the advantage of being entirely in keeping with the French style of furnishing that is seen in so many drawing-rooms. And whereas in former days they were apt to look very sombre with their heavy, untrimmed curtains, draped as they now are with hangings decorated with embroideries, appliques, and fringes in the Louis XVI. style, they present a very different effect. The revival of the pelmet, also, has a great influence in adding to the appearance of such windows, and a good example of what may be done in this direction is seen in Fig. 1. In this case the pelmet is not only cut with a curved line at the lower edge, but is shaped at the top, thus obviating any stiffness. The enormous variety of really charming embroidered and bordered curtains of moderate cost greatly simplifies the whole question of how to drape this type of window. Curtains can be found in styles which are in accord with every style of furnishing. In Fig. 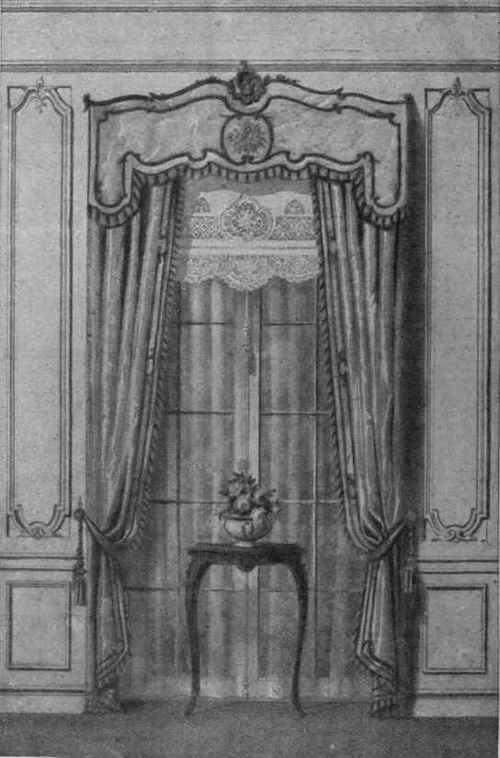 2, for instance, will be seen a good curtain adapted to a room furnished after the Georgian manner. 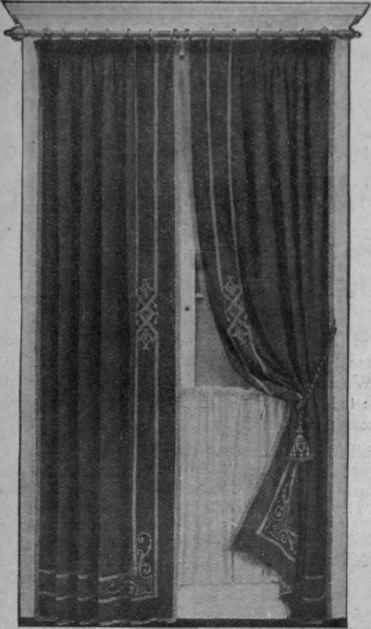 These made curtains are all, of course, composed of fabrics suited to the purpose. Felt is the favourite material for winter, and brocades of all kinds are very much used. But there is one point which is essential to remember in choosing any material that is to be made up into long curtains. It should not on any account be too stiff or ha to fall in good folds, nor should it, on the other hand, hang limply. A correct lining is another secret of success, and with a chintz or cretonne an interlining also will be required. For the rest, your selection must depend to a large extent on the amount of money at your command. Silk brocade, though it sounds, and is, expensive at the beginning, is one of those extravagances which time may justify as an economy. The writer knows of such curtains lasting over twenty years, and they always look well if a good design and colour has been chosen. One is not nearly so apt to tire of curtains made of really good material. It may therefore be quite worth while to economise on other things, and lay by a nice little sum for your curtains, since they certainly add an air of dignity, comfort, freshness, or whatever else you most desire to express in your room. At the same time, in certain rooms simple fabrics may produce an admirable result. Avery delightful illustration pf this fact is seen in Fig. 3, where pelmet and curtains are made of green linen with a printed border. The shape of the pelmet and the long, unbroken lines of the curtains are admirable. Indeed, it may be taken as a rule that, except in French rooms, it is better not to catch back the curtains. This particular ar-rangeme n t would look well in any room furnished in the modern style With a suitable border it could also be used in either a Georgian or Victorian room. Some people prefer a draped "swag." For this again brocade is a good choice, but anything with stripes must be avoided, as striped materials do not lend themselves to draping. What am I to do to make it look well? " and that is the room of which one end is all windows - three long ones reaching to the floor. The writer has seen one such room managed very successfully in the following manner: One of the outer windows was filled in up to a height of about 3 feet 6 inches with woodwork painted white, and finished with a shelf at the top. Above this was stretched on brass rods a blind of thin gold-coloured silk, and at the sides hung curtains of the same. The other two windows were curtained in the ordinary way with dull gold and terra - cotta brocade, and had blinds of . cream Nottingham net. The appearance given was that of a smaller window at the side of the two longer ones. A large Chesterfield sofa practically hid the woodwork of the filled-in window. It was a north room, and an appearance of sunshine was given by the golden light passing through the yellow silk. A still better idea, however, has been carried into effect in the drawing-room of a well-known architect. Here the whole of the centre window is filled in, and all are supplied with simple, long muslin blinds. Thus it is possible to treat the centre window as a part of the wall, and to place a piece of furniture against it. In the case in question it forms an admirable background for a very beautiful and original cabinet designed by the owner, Mr. George Walton. The extreme simplicity of the scheme ensures its success, and the lack of any curtains will appeal very much to those who, on the ground of wanting all the sun and air they can get, forswear hangings of any kind. Another reader may be in an equal state of despair about a suburban bay window, and be longing for casement windows in its place, on account of the dainty countrified look these give. The one thing to avoid is to hang this bay window with casement blinds, which would have the effect of reminding one of the proverbial ostrich with its head in the sand. Short curtains of chintz reaching a little way below the window-ledge, and with a pelmet to match, form a far more satisfactory solution of the difficulty. The pelmet should be shaped, and have a box-pleat at intervals, which has a very quaint, old-world effect. There should be a window-seat with loose cushions, covered with chintz and edged with a flounce. The roller blinds may be of linen in a small green trellis design, edged with a fringe. These simple blinds help to carry out the old world effect of the scheme. An excellent notion is to have the brass rods for the short net blinds fixed considerably above the centre of the window. so that its stiff appearance of being divided in half is avoided. This is a good plan with any sash windows. The only disadvantage is that as the rods must be fixed on the framework, and not on the window, the centre window will not open easily. It is I not necessary to have clips for the lower rod, as its weight holds the blind in plate. One good rule to remember with regard to bay windows is that curtains for them should never form a direct contrast to the wallpaper, but always either match it or harmonise closely. This prevents the rather unsatisfactory shape of the window from being accentuated, as it would be if the curtains formed a complete contrast to the walls. With high, straight windows,how-ever, decided contrasts may often be successful, as, for instance, rose-coloured or green curtains with buff walls. Roller blinds should always be used with these windows also, those of plain holland with a lace edging being most popular. The best blinds have hand-made lace put on as an applique border. This will outwear the holland, and is worth some extra initial expense. A new idea is to have brise-bise blinds with a lace border identical to the one used on the holland roller blinds. The question of blinds, however, opens up a wide subject, which cannot be included in the scope of this article. But this is a subject which will be dealt with at length in a subsequent article, since, in the treatment of windows, the question of blinds is of supreme importance.